Moses E. Willoughby was doing maintenance chores in Okinawa when a Vietnam-bound bomber crashed on takeoff. He and another airman rushed to rescue the crew from the massive fire that ensued. Moses E. Willoughby, 72, who as an Air Force Staff Sergeant in 1968 rescued six men from a burning crashed aircraft, died of congestive heart failure September 4, 2008, at his home in Lothian. After his military career, he worked for the D.C. police department. Sergeant Willoughby, an ordnance supervisor, was doing maintenance chores Nov. 19, 1968, at Kadena Air Base in Okinawa, Japan, when an explosives-laden B-52 bomber bound for Vietnam crashed at the end of a runway on takeoff. Fire immediately consumed the aircraft, and most of the crew scrambled into a nearby ditch as the full fuel tanks ignited, just before the bombs detonated. The tail gunner, who had escaped through the back of the bomber, ran back to the runway, where emergency vehicles had been held back because the bombs were about to explode. Sergeant Willoughby and another airman noticed human motion through the 450-foot flames, jumped into an ordinary military pickup and drove to the crew. Gary Sible, the B-52's navigator, had broken his leg during the crash but with another crew member managed to climb a chain-link fence to escape the burning jet fuel. He told the Willoughby family in an e-mail that he and his buddy, who also had a broken leg, were hobbling along an adjacent road when he saw Sergeant Willoughby's pickup, already loaded with four other crew members. "Nothing ever looked so good," he wrote. "I do not know which of the guys drove the truck but the other was in the rear with the rest of the crew giving aid as best he could. The driver tore out toward the infirmary at a pretty high rate of speed. We could not stay on the road because there were fires all over the place. "We dodged them all and came roaring into the infirmary with the horn of the truck blaring. The staff of the infirmary came running out. They could not believe anyone (let alone all) could have lived through the explosions." Two badly burned crew members later died of their injuries. 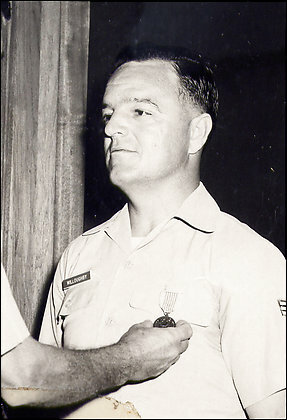 Sergeant Willoughby received the Airman's Medal for his actions. The crash drew little attention in the United States, but it fed opposition within Okinawa to the existence of the base on the island, which the Americans had occupied since World War II. The crash occurred just 300 yards from a huge ammunition dump rumored to contain nuclear weapons. Okinawans staged a series of large protests, which eventually contributed to the reversion of the island to Japan in 1971. Sergeant Willoughby became a transportation coordinator upon his return to the United States and supervised the motor pool at Andrews Air Force Base for a time. He retired from the Air Force in 1975 and joined the D.C. police force as a tow crane operator. He retired from the police department on disability three years later. He was born in Winterville, North Carolina, and joined the Air Force after high school. Survivors include his wife of 51 years, Betty Cornwell Willoughby of Lothian; four children, Moses Willoughby Jr. of Medina, Ohio, Laurie Ann Callahan of Crofton, Dwayne Willoughby of Mechanicsville and Joseph Willoughby of Brandywine; eight grandchildren; and three great-grandchildren. MOSES EARL WILLOUGHBY S/SGT (Ret.) On September 4, 2008 of Lothian, Maryland. Beloved Husband of Betty Lou Willoughby; loving father of, Moses Earl Willoughby, Jr., Laurie Ann Callahan, Dwayne Edward Willoughby and Joseph Eugene Willoughby; brother to Jasper Earnest Willoughby. Also survived by eight grandchildren and three great-grandchildren. Funeral Service will be held at Dunkirk Baptist Church, 11275 Southern Maryland Blvd, Dunkirk, Maryland, on Tuesday, September 9 at 11 a.m. Interment Arlington National Cemetery, Tuesday, November 4, 2008, Fort Myer Chapel at 12:30 p.m. In Lieu of flowers, memorial contributions may be made to Hospice of the Chesapeake, 445 Defense Highway, Annapolis, Maryland 21401.